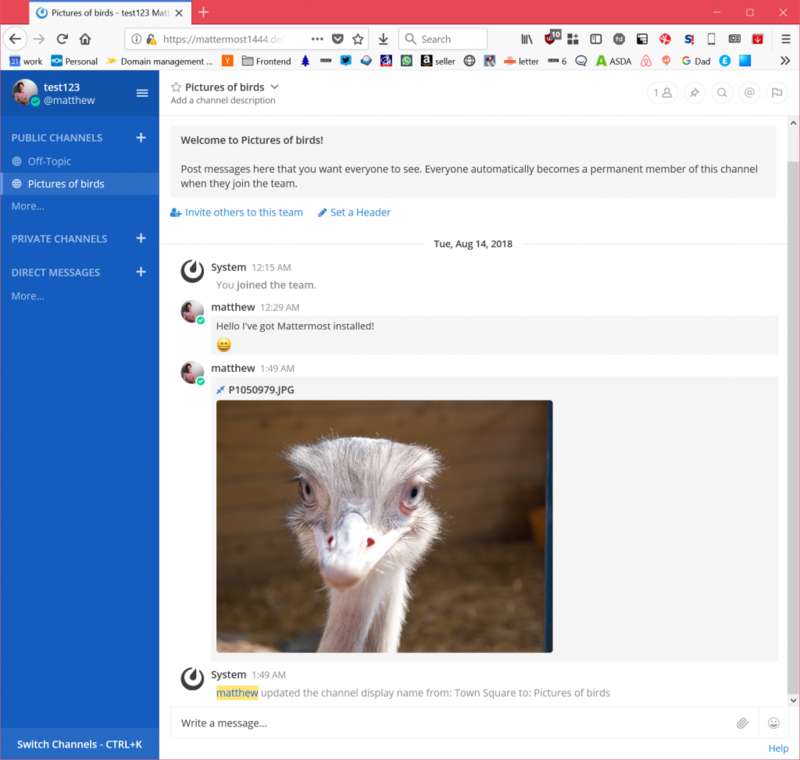 Mattermost is an online chat application which you can host on your own server, and administer your community from your web browser. It takes around 20 minutes to install. We’ve based these instructions on the Docker instructions and simplified them. You don’t need to make as many decisions if you’re hosting at Bytemark, and we can also support you in getting it up and running. If you’ve tried this before and got stuck, don’t worry! We’ll show you how to pull together Debian, Docker and self-hosted email so that you can get your team running on Mattermost in about 20 minutes. Boot Options: Select the ‘Add script‘ option, and copy and paste the following script (see the ‘Installing the software‘ section, below) into the text box. Authentication: You can leave this setting alone and a password will be generated for you, or you can select ‘SSH key (+ Password)‘ to enter your SSH key. Click the ‘Add this server‘ button to begin installation. If you’re using Bytemark to create your server, you can copy & paste this firstboot script. 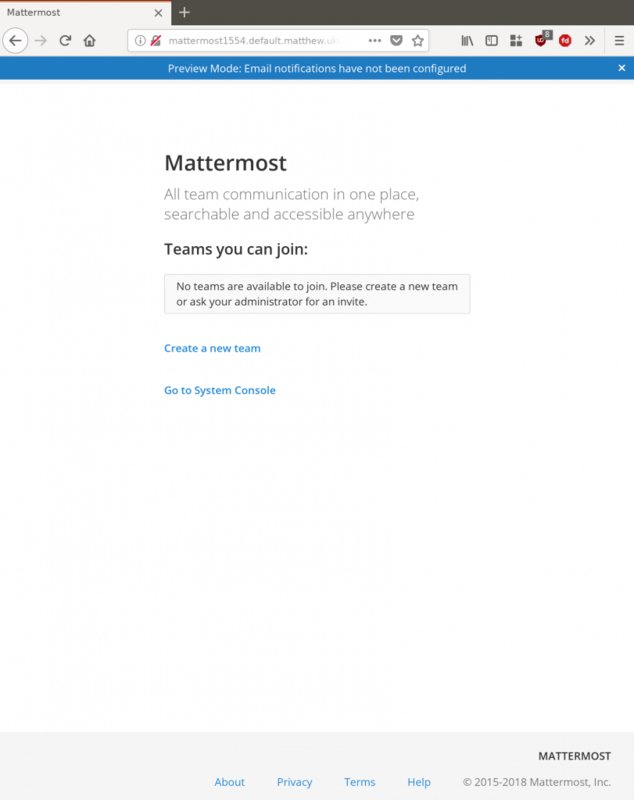 It will install Mattermost and set it up in one shot. 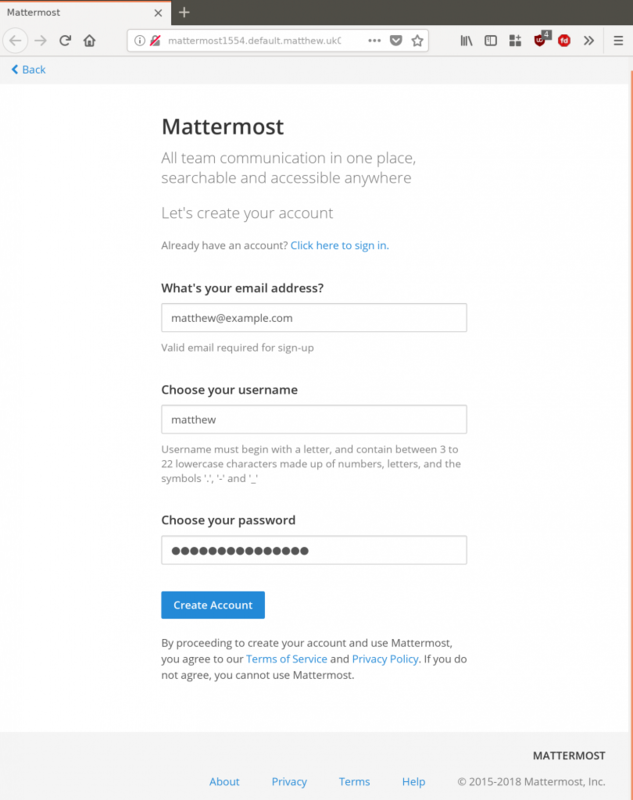 Mattermost will now install. While you’re waiting note down the server password! You can keep it, or change it later (see below) but if you lose it you’ll need to contact support. And that’s it! You should see the Mattermost welcome screen. You can see that ugly blue banner at the top – let’s go and setup the site a little bit before we dive in and starting using it. So click ‘Go to System Console‘ link. Don’t touch the SSL settings, since this is handled outside of Mattermost. Click the ‘Save‘ button at the bottom of the window. Click the ‘Test Connection‘ button (you may need to scroll down the page a little to find the button). Assuming you get a ‘No errors were reported…‘ message and you receive an email, you’re good! Right now nobody else can create an account on your server. Here’s where you can define who’s allowed on. If you want a server where anyone can register, change ‘Enable Open Server‘ to true. Alternatively, if you just want to invite new people, you need to set ‘Enable Email Invitations‘ to true. We’d recommend changing ‘Require Email Verification‘ to true as well. 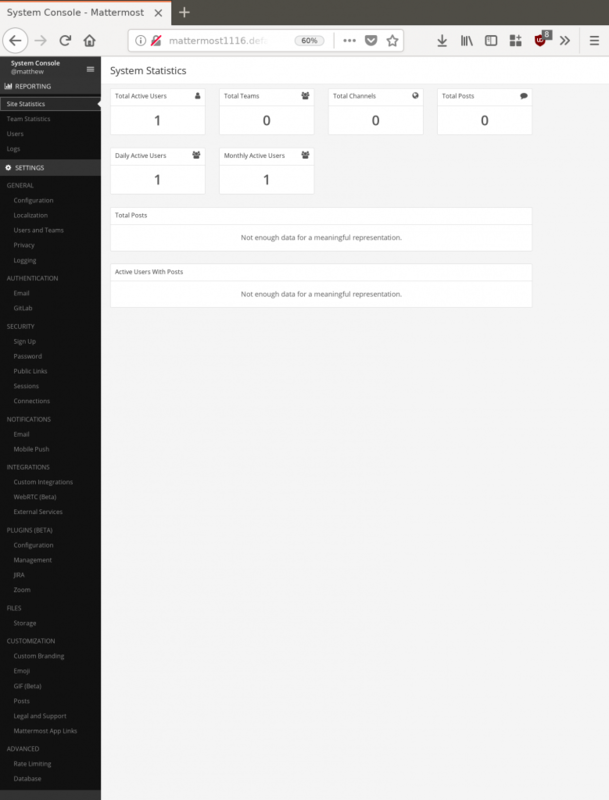 The sections General > Users and Teams and General > Privacy have some important settings around how your team members register and are visible from the outside. But if you’ve just followed the guide so far, the site will let people register themselves for an account from the front page.